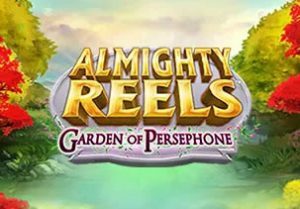 Based on the ancient Greek goddess of the underworld, Almighty Reels - Garden of Persephone is a myth and legend themed slot game from Novomatic. Played using a 5 reel, 25 payline game engine, it comes with a bonus round that awards 10 free spins with 1 symbol appearing in giant 3x3 blocks throughout. Play on all devices from between 25p and £100 per spin. As you’d expect given the theme, there’s a strong classical feel to the design here. With the trees and plants of Persephone’s garden in the background, the action takes place within a marble columned building. On the reels you’ll see A to 10 royal values as well as a cornucopia, a harp, a vase and a Spartan warrior’s helmet. The best-paying symbol is Persephone herself. Land 3, 4 or 5 of the Greek goddess and you’ll pocket an award of 1, 2 or 4 times your total stake. The golden temple building symbol is the wild. This can hit on all 5 reels and substitute for everything apart from the scatter. The scatter is the gold coin. This spins in an oversized 3x3 block. If it lands in full, you’ll trigger the Free Games feature where you’ll get 10 free spins. Before the round begins, 1 of the higher value themed symbols will be selected at random to be the giant symbol. This will then spin in giant 3x3 blocks throughout the free spins. Garden of Persephone is a relatively simple game. The design is better than many earlier Novomatic releases but still not quite up to the HD spectaculars you’ll find from the likes of ELK Studios and Thunderkick. It’s easy on the eye though which can’t always be said of slot games from this developer. The gameplay is as straightforward as that design. The oversized symbols can certainly move things along, especially if you land a higher value giant symbol during the free spins. This isn’t a very volatile game though. In fact, the variance is in the low to medium range which is unusual for a Novomatic slot game – you can win 100 times your stake on every spin which is low. This isn’t one of Novomatic’s most exciting slot games. It’s all perfectly solid but lacking a little flair. If you enjoy the myth and legend theme, then I recommend Age of the Gods from Playtech which has a huge top payout.